OK, so I’m a convert. I’ve been gardening mostly with “exotic” plants (i.e. 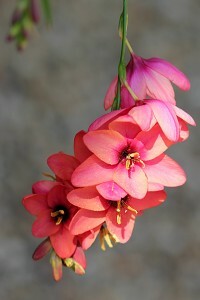 not our native South African plants) simply because I prefer the so-called exotics. Or so I thought. 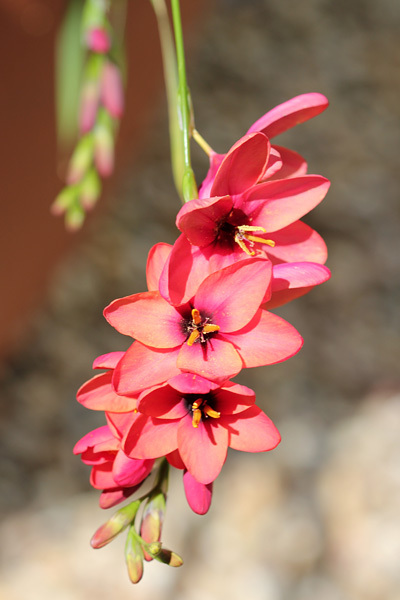 I do have a few indigenous plants in my garden but if I’m being very honest, they are not my favourites, and were not planted by me. Hence the belief that I prefer “exotics”. 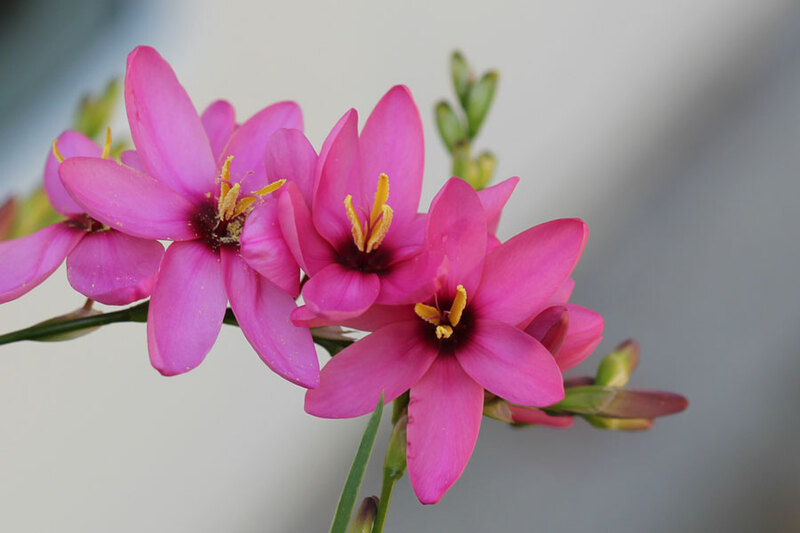 In April I planted all the bulbs I bought and amongst those were Freesias and my new favourite, Ixias, both of which are native to South Africa. 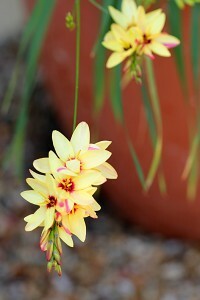 The Ixias were a freebie included by the Bulb Company when I ordered all my spring flowering bulbs. After lovingly planting all my “exotic” bulbs, as an after thought, I bunged the free Ixias in a huge, slightly broken, not very attractive terracotta pot that I put right outside my office doors – the doors that lead outside. They sat in the pot and I confess that I didn’t water them very regularly, was disinterested in them and paid them no very little attention. Not even when the shoots emerged and looked kinda scraggly did I take much notice. I just kept thinking “I must move that awful pot sometime”. The leaves of the plants continued to grow and started looking moderately attractive. 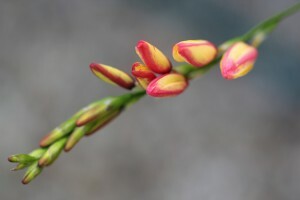 “Hmmm, not too shabby after all”, I thought as the stems started to emerge. The first flower buds started appearing atop a long wiry stem. And oh they are sooo pretty! My pack of bulbs must have been mixed, because I seem to have them in all sorts of colours. 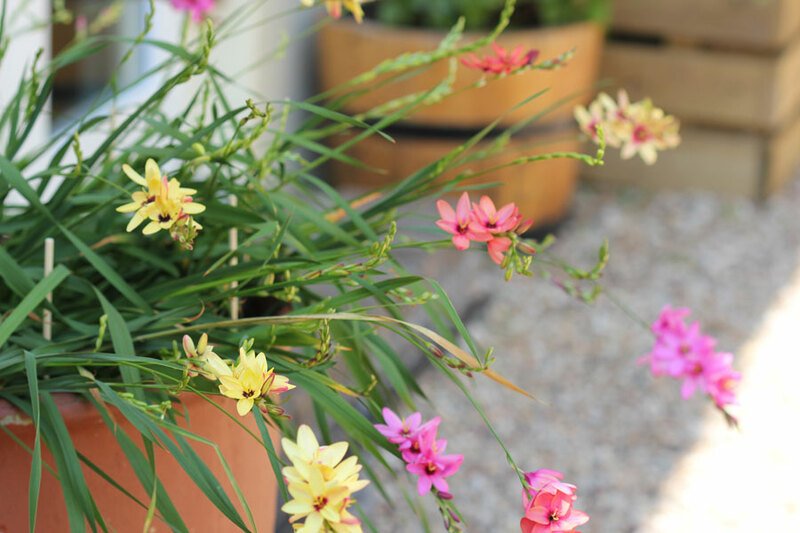 Reds, orange, yellows, yellow with a touch of red, pinks … and they look sort of wild and wonderful all tumbling over the rim of the pot. Some stand upright but mostly they are waving around and tumbling. 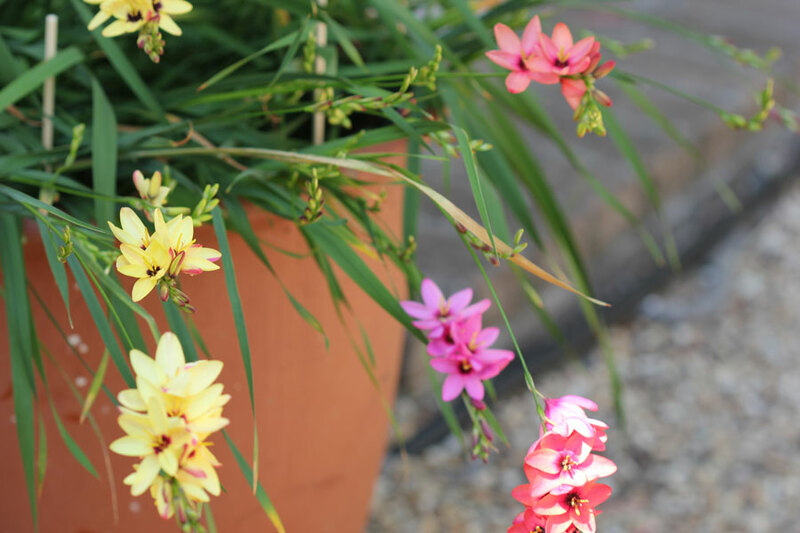 Now the first thing I do every morning is go to the pot to see if there are any new colours and I waste about half an hour taking endless photos of them … they are a delight to photograph (Click the images below to view the enlargements). I think they are supposed to stand straigh up – mine are sort of “tumbling” towards the sun. I don’t think they get quite enough sun in that spot but thats as sunny as it gets in my garden. Only about 20 are in bloom right now with another 80 in bud! Should be pretty spectacular when more are flowering. 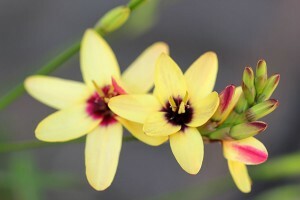 I even have two Ixia Viridiflora – they are a rare version which are turquoise – I wonder if they will make it – I don’t remember where in the pot I planted them. (Known as Green ixia or groenkalossie – in Afrikaans- it is an exquisite species with many-flowered spikes of sea-green blooms with black centres). So now I’m wondering … have YOU ever planted something half-heartedly, just because it “was there”, and then fallen in love with it? I’d love to hear! Well, what do you know? The true joys of gardening. It is the surprisingly ordinary that becomes the extra-ordinary! They are absolute beauts!! And what makes it special – you gave them no extra care…… how fabulous! Wow, they are just gorgeous! I love it when native blooms turn out to be just as stunning as some of the exotics. 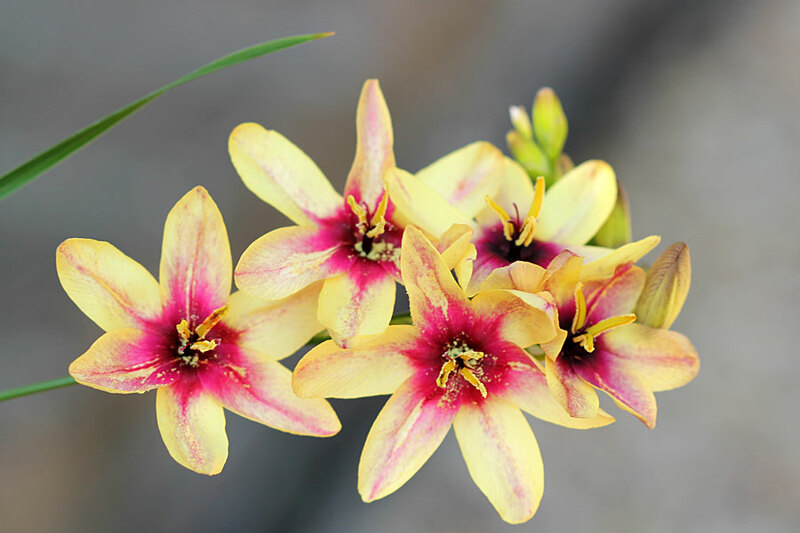 The Ixia blooms remind me just a little of Freesia. The yellow with dark centers I think are my favorite, but they’re all pretty. I wish all native flowers were this eye-catching! Do you think you’ll intentionally plant more of them? 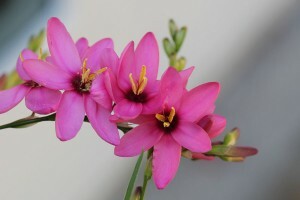 hi Clare, absolutely will plant them again! massed in a bed next time! also going to open my mind to other native plants. O I totally agree, your natives are spectacular. Thank you for sharing such beautiful photographs, I am in love with that understated elegant flower! My gosh Christine, they really are pretty in all those candy like colors. They would be welcome in my garden if they were native here. The yellow in your first image is my favorite. The draping form is pretty nice too. Funny how you ignored them until they showed their beauty. And these are beautiful! I can see why you enjoy them each morning. I would love to see your turquoise blooming! I have planted lots of things half heartedly, and if it lives, I love it! Success ;~(0) !! 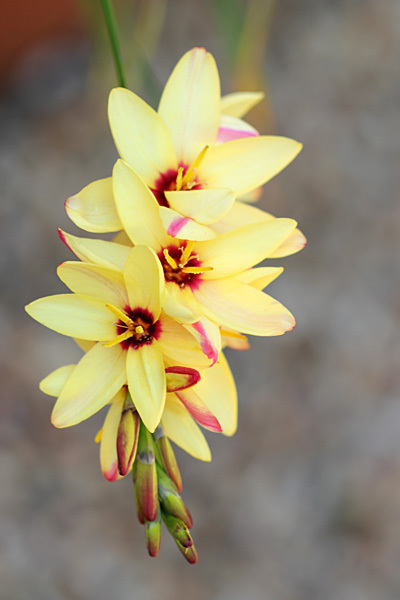 The turquoisy viridiflora I have in Lachenalia. A magical colour. 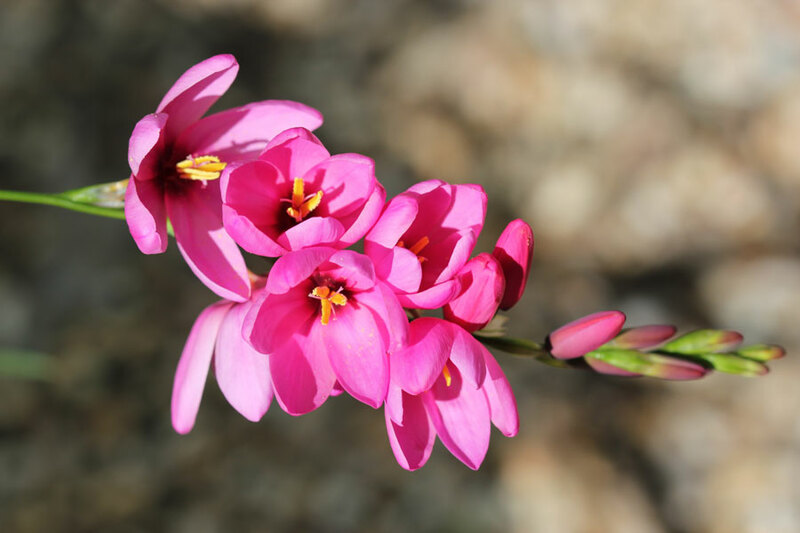 Hi Diana – I went to your blog and searched for the Lachenalia but couldn’t find a photo of the Viridiflora. 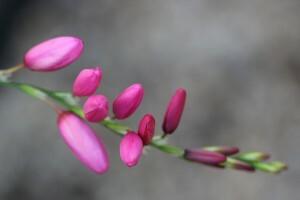 Would LOVE to see a photo when it blooms again!